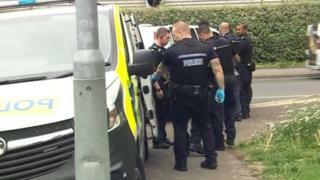 A number of suspected illegal immigrants, including children, have been found in the back of a lorry in Portsmouth. A total of 31 people were discovered on Quartremaine Road at about 08:00 BST. The Home Office said the group included 22 men - including 18 from Iraq and three from Iran - aged between 20 and 30, and five unaccompanied children. There was also a family of four, including two children aged two and four. The unaccompanied children, aged 16 and 17, and the family said they were Iraqi, a Home Office spokeswoman said. One of the men in the group did not declare his nationality, she added. The family members were taken to hospital as a precaution but later discharged into the care of the police. They will be "released to report regularly to the Home Office while their case is progressed", the spokeswoman added. The men remain in immigration detention for further interviews, while the unaccompanied children have been referred to social services. Portsmouth City Council said the five teenagers were now in its care. "All cases will be progressed in line with the UK immigration rules. Where someone has no right to remain in the UK, we will take action to remove them," the Home Office said. Witness Gary Spurrier said about 20 police vehicles and ambulances were sent to the scene. Another witness, Kevin Streeter, said: "A couple [of those detained] sort of lay on the path, dehydration maybe the cause. "They did look pretty drawn out and really tired."